The fischer group of companies has been setting standards in fixing engineering for more than sixty years. Established in Germany in 1948, the enterprise is today represented world-wide with 33 subsidaries in 30 countries. The family-owned fischer group, generating sales of over 560 million Euro in 2008 with 3,800 employees, is managed in the second generation by Klaus Fischer (President and Owner). fischer is market leader in the anchor engineering market in Germany, Europe and also world-wide. Distribution in over 100 countries. Innovation and customer orientation are not just empty words at fischer. Ever since fischer’s grey nylon S-plug was launched in 1958, there has been ongoing development of new fastening solutions for a whole range of different applications. In addition to the wide choice of plastic anchors, there is also a growing need for steel anchors and chemical fixing systems. 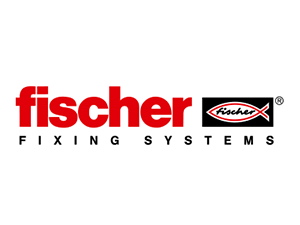 fischer the fixing specialist has always been far-sighted, and has long featured a variety of foams and sealants in its product range. The SaMontec series (sanitary and heating fixings) as well as the E-Fix series (electrical fixings) cater to special needs. Since 2009 the fixing specialists offer a unique and unparalleled range of screws setting new standards in wood and timber work. The new fischer Power fast screws are extremely easy and comfortable to set and allow for fast and convenient work: less effort – lower costs. Despite the huge success of the classic S-anchor – the world’s most produced, most copied anchor – fischer keeps pushing ahead with innovative new products. Launched just a few years ago, the UX with its quadruple expansion sleeves marked the first of a new generation of fixings. fischer has also developed the very first post-expanding plastic fittings in the form of the new SXS long shaft plug and the patented CO-NA screw. In 2008 fischer presented a new, innovative and global solution for fixing a wide range of items in virtually all load-bearing building materials. The Long-shaft fixing SXR 10 is the very first plastic fixing (ø10mm) awarded the European Technical Approval (ETA). fischer also leads the way in the field of fixings for heavy loads, e.g. with its FZA Zykon anchor. The fischer FAZ II anchor bolt, provides significantly better performance values than comparable anchors thanks to the patented black double expansion sleeve. Chemical fixing systems step in when plastic fixings are not strong enough and steel anchors lack the necessary grip. Most fastening problems can be solved with FIS V 360 S styrene-free injection mortar (with official technical approval) for concrete and perforated stone. Fischer’s new Highbond injection anchor provides a high-tech solution for holes with low edge and axial distances at high maximum loads. The unique, adaptable and successful Highbond System for fixings in cracked concrete has an outstanding newcomer. The new resin cartridge FHB II-PF cures up to 90% quicker than the best rival system. At a temperature of 21°C, the resin cures 100% in just two minutes.